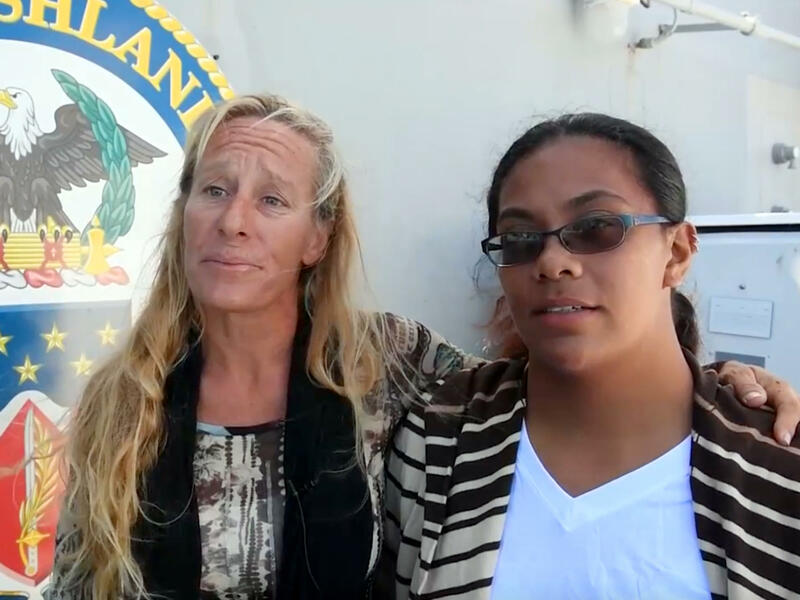 Jennifer Appel (left) and Tasha Fuiava are interviewed aboard the USS Ashland in the South Pacific on Oct. 25. They were rescued after reportedly drifting for months while trying to sail from Hawaii to Tahiti. It's a great story: Two women and their two dogs, adrift at sea for more than four months after storms damage their sailboat, are rescued by a U.S. Navy ship 900 miles southeast of Japan. "There is a true humility to wondering if today is your last day, if tonight is your last night," one of the sailors, Jennifer Appel, told reporters last week. But questions are beginning to mount as more details of their journey emerge. Here are a few of the strange turns in this tale of survival. The sailors had an emergency beacon, but they never turned it on. In a conference call with reporters after their rescue, Appel said their boat, Sea Nymph, had been sending distress signals for 98 days. She says they sent up at least 10 flares when other vessels were visible, to no avail, according to the Honolulu Star-Advertiser. "I could see light and I could see vessels and I watched them get closer and we thought it would be close enough to do a call or, if it was pointed our way, we would shoot flares and hail it on a [very high frequency radio]," her traveling companion, Tasha Fuiava, told the Today Show. "When they would turn or keep going — yeah, it was kind of sad." But in subsequent interviews and a U.S. Coast Guard review of the incident, Appel confirmed that the pair had an Emergency Position Indicating Radio Beacon, or EPIRB – but never turned it on. Why not? Appel told The Associated Press that in her experience, the beacons should be used only when sailors are in imminent danger and could die within 24 hours. "Our hull was solid, we were floating, we had food, we had water, and we had limited maneuverable capacity," Appel said. "All those things did not say we are going to die. All that said, it's going to take us a whole lot longer to get where we're going." "EPIRB calls are for people who are in an immediate life threatening scenario," Appel wrote in a statement to ABC News. "It would be shameful to call on the USCG resources when not in imminent peril and allow someone else to perish because of it." Instead of making a mayday call, Appel told ABC that they used a "pan-pan call" to let the Coast Guard and other boats know that the Sea Nymph had issues "but they are not immediately life-threatening." They thought they had 200 miles of reception on their radio, but discovered after their rescue that antenna issues meant they had only 1-2 nautical miles of reception. Phillip R. Johnson, a retired Coast Guard officer who was responsible for search and rescue operations, told the AP that the women would have been found quickly if they had turned on the beacon, which transmits its location to rescuers within minutes. "If the thing was operational and it was turned on, a signal should have been received very, very quickly that this vessel was in distress," he said. In an earlier interview with CNN, Appel rattled off a list of communication devices that failed. "We had no way to realize we were about to enter a typhoon that had winds of 110-150 miles an hour and minimum wave heights of 40 foot in height." "How is is possible that all of these different communications devices malfunctioned?" asked CNN's Ivan Watson. "They are dependent on the antenna," Appel responded. "And when the antenna went out, everything went out." They describe a harrowing storm that rocked their boat. But National Weather Service records don't show major storms at that time. Appel and Fuiava say they set off from the Ala Wai Boat Harbor from Honolulu on May 3. They planned an 18-day trip at moderate speed to Tahiti, and then planned to explore the islands of the South Pacific for up to six months, returning to Hawaii ahead of hurricane season. Things apparently started going wrong on the very first night of their voyage. "We got into a Force 11 storm, and it lasted for two nights and three days," Appel said in the interview aboard the USS Ashland after their rescue. "And when we got through with that, we were empowered to know that we could withstand the forces of nature, the boat could withstand the forces of nature." But the National Weather Service in Honolulu told the AP that there was no organized storm system near Hawaii on May 3 or the following days. "Archived NASA satellite images confirm there were no tropical storms around Hawaii that day," the AP reports. "Appel expressed surprise that there was no record of the storm. She said they received a Coast Guard storm warning while sailing after sunset on May 3." The Coast Guard told the AP that it made radio contact with a boat that identified itself as the Sea Nymph in June near Tahiti. But the boat's captain said they were not in distress and expected to make land the following day, though that would have been after the boat had lost its engines and had damaged rigging and mast. "It's not clear it if was the women, who told the Coast Guard they were 1,500 miles away, near Christmas Island," the AP reports. They are very upset about the tow they received from a Taiwanese fishing vessel. After reportedly drifting for months, the sailors were spotted by a Taiwanese fishing boat, which called the Coast Guard in Guam and began to tow them. "The crew of the USS Ashland saved our lives," Appel said. "Not from the ocean, but from the vessel that was trying to render assistance to us. Had they not been able to locate us, we would have been dead within 24 hours." "We thought we had it bad during the entire trip, and then that 24 hours of being towed ... I kid you not, that was the scariest moment of the entire trip," Fuiava said in the interview on the Ashland. She said they were nervous the Navy rescue boat was going to pass them by, "after so many times of having people turn away from us after hearing us." The sailors described the damage their boat sustained during the tow, which left them worried about the boat's ability to stay afloat, ABC reports. The Navy determined Sea Nymph not seaworthy, and let it drift away after the rescue. "The pictures speak a thousand words," Appel told ABC. "It is absolutely phenomenal the amount of damage that they did to the structure of that boat. So that kind of help speaks for itself." The AP reports that Appel said she had modified the boat with 6 tons of fiberglass to make the hull stronger and had extended its keel to add stability. In an Oct. 25 interview onboard the Ashland, they were asked to describe the emotions they felt after the rescue. "How do you describe the color blue to a blind man?" said Appel. "It's relief and elation and joy." "And utter sadness," added Fuiava. "Because that was our life, that was our home. [Appel] built that for the last two and a half years. ... She took something that was broken and made it whole. It saved our lives multiple times throughout this whole entire trip." "So yeah we were really relieved that you guys were here, but Nymphy was our baby," Fuiava said, starting to cry. "She's strong and we have the bilge on, and we're just hoping to get her back."